Texture is the surface quality of a object. It can be both tactile and visual. We have a lifetime of experiencing both. We know what certain things feel like, so that we can essentially experience the tactile sensation just by seeing the texture. With a house, you aren't likely to go around touching all the surfaces. Some, like the roof, you may never touch. Yet you will see the surfaces everyday, so our main concern is the visual impact of the texture. This wall of river stones adds a unique texture to an old house in Michigan. In architecture texture is achieved through the skin of the building, but also by repetitive patterns that are spaced closely enough to create a perceived texture. Lap siding creates a certain texture, but so do the horizontal and vertical stripes on a skyscrapers. Those stripes may be no closer than one floor apart, but looking at it from a distance they create a textile pattern that takes on the illusion of a surface finish. A smooth concrete has one type of surface and it will be consistent throughout the day. Cover that cement with stucco or a pebbly ingrain and you get a texture that changes with the shadows. Through surface relief you can create a house that changes its looks through the day. Textures are important in architecture. Why are so many houses covered in a siding that replicates wood lap siding? It is partly tradition, but is also because it is a texture that we recognize as being comforting and home-like. We could do just as well to side with corrugated metal, and it would be just as visually interesting, but that texture does not say home. Spanish tile adds a certain kind of texture, dimensional shingles another. Here a clever variation in the layout of the shingles adds additional interest. Note the shadows on tiles to the right. Late Victorian houses often used shingles in various shapes to decorate their houses. 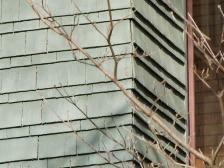 Sometimes these shingles even resembled fish scales. It is not that Victorians had an innate love for fish scales, but the shingles created texture, and that created visual interest. It was not just that the houses had texture, but they used the various shapes of shingles to vary that texture so that your eye would move from surface to surface discovering new things. 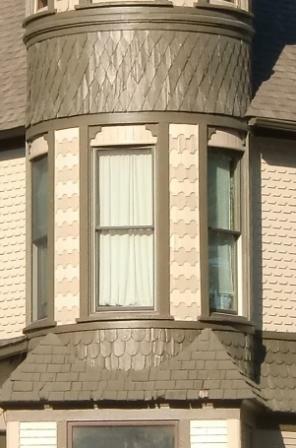 The shingles on this Queen Anne tower not only add texture, the provide an excuse to vary the color. 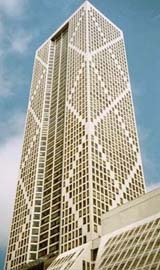 The Onterie Center in Chicago has vertical, horizontal and diagonal striping. The pattern itself becomes a texture when viewed from a distance. To understand how texture can effect other characteristics consider the case of rusticated block. Rusticated block is a stone or concrete block that has rough edges. It doesn’t look neatly hewn. It looks more like native rock. It has a very rough look when compared to brick or block or hewn stone or marble. Stone buildings often have a rusticated stone on the ground floor, or as a foundation. This was true in antiquity, it was true in the Renaissance, it is true today. That rough surface gives the rock the illusion of being especially strong and solid. From an engineering standpoint, the rock is not any stronger than one with polished sides, but it looks stouter. If you were to reverse the courses and have rusticated stone on top and smooth stone on the bottom, the building would seem top heavy. Our inner sense of balance would rebel. The rough feel creates an illusion of mass which in turn affects the balance of the building. 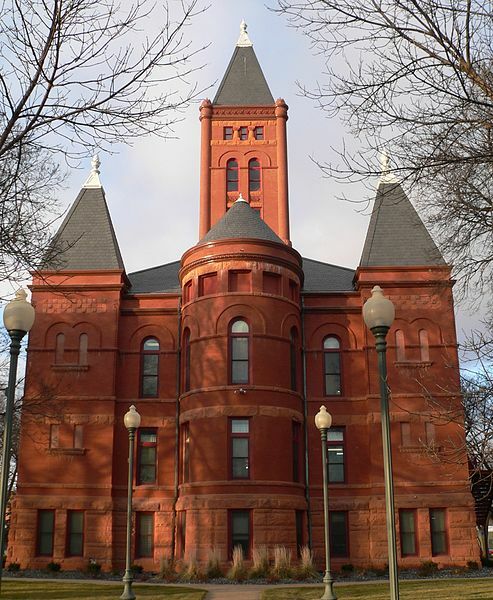 This courthouse in the Richardsonian Romanesque style has a rusticated ground floor. Additional thin layers of rusticated block add interest by varying the texture and color from the predominant brick.